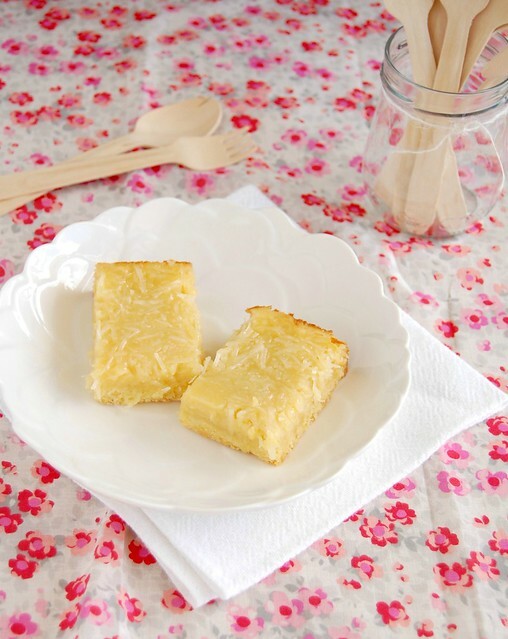 Technicolor Kitchen - English version: Coconut custard bars + the unforgettable "Hugo"
As I sat on my chair and started enjoying my popcorn, several kids entered the theater and sat down, too, waiting for the film to start. That is not something I see very often, given the sort of movies I usually watch. Fifteen minutes into the film and I thought to myself, “are these kids lucky or what?”, because as a child I did not have the opportunity to see something so strikingly beautiful, so perfectly made – actually, to be honest, even as an adult I haven’t seen many movies as beautiful as “Hugo”. I was mesmerized by the images, the colors, the sounds – I was in Paris. Asa Butterfly and his big blue eyes (which remind me of Elijah Wood’s) won my heart completely – he made me cry like a baby and by the end of the movie I wanted to take the kid home with me. I know Scorsese is a very gifted director and has the ability of improving just about anyone’s performance, but I never imagined he’d be so good at directing kids. On the other side, for each tear I shed there was lots of laughter with Sacha Baron Cohen – I thought he was delightful to watch, funny and adorable, which, to me, is Scorsese’s touch again (those of you who have watched Cohen’s previous performances might agree with me). I wish I could tell you more about “Hugo” but I loved it so much and it moved me in such way that I sort of got speechless – this 33-year-old won’t be forgetting Martin Scorsese’s “kid’s movie”. Ever. Make the crust: preheat oven to 180°C/350°F. Butter a 22cm (9in) square pan*. Place flour, sugar, salt in the bowl of a food processor and process until blended. Scatter butter pieces over the flour mixture and process until mixture resembles coarse meal. In a small bowl, whisk together egg yolk, water and vanilla. With food processor running, add yolk mixture through the feed tube and process just until the dough begins to come together in large clumps. Scrape the dough into the prepared pan and, using your fingers, pat it evenly into the bottom of the pan. Bake crust until golden, 20-25 minutes. Transfer the pan to wire rack and cool completely. Leave the oven on. In medium bowl, whisk the eggs, egg yolk, and granulated sugar until blended. Slowly whisk in the coconut milk. Whisk in the vanilla, rum and flour and salt. Sprinkle the coconut evenly over the cooled crust. Pour the filling through a fine sieve over the coconut, covering the crust completely. Bake for 25-30 minutes or until filling is set and the edges are golden brown. Cool completely in the pan on a wire rack. Using sharp knife, cut into bars. As always, beautiful bars! I'm drawn to the decadent coconut-rum filling. I haven't seen "Hugo" yet, but now you've convinced me to see it immediately. such flavorury bars!!! mouth watering:-))) thanks for sharing the recipe!! I like this recipe and all your blog. It's so great! Oh these look so perfect for Spring! In fact, I think I'm going to make these for Easter brunch! I SO want to see Hugo -- I think my daughter is still a bit too young, but I've heard it's such a lovely movie -- I can't wait to see it! I really need to watch the movie now!! Past Christmas I decided to take all my sister's children (5) to the theater as a Christmas gift (to them and to her :) ) While I was looking was would be on, I stumbled upon Hugo and I was thrilled by the story... I felt so bad when I discovered the movie wouldn't be out until after Christmas! I didn't have any excuses to go and see it! Now I know, as soon as I got the dvd... I will watch it again and again! OH my, these would be perfect for Easter! Or anytime really! :) Yum! Hi! I really want to make these but curious about the coconut milk; do you mean coconut milk from a tin found in the cooking isles or from a carton (as in the thinner breakfast milk)? I have the former but don't want to have to go out and buy the latter! If it is the breakfast one you are referring to, could I use another kind of milk instead? It's the coconut milk from a can, the one used in Thai food, etc.